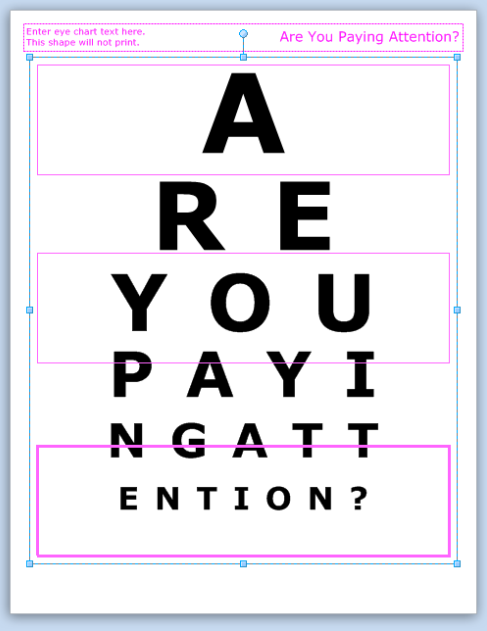 Eye charts can be fun when…you’re not at the Eye Doctor! 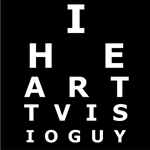 This Visio eye chart template allows you to quickly create your own eye chart to amuse your audience and get your point across! Via Gizmodo, I came upon this New York Times article: Expanding the Creative Horizons of Your Printer. 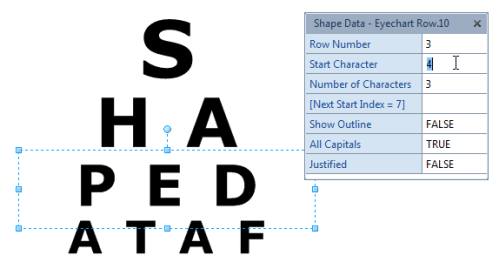 As soon as I saw the eye chart, I got the idea to create a Visio eye chart template using SmartShape technology and the ShapeSheet. 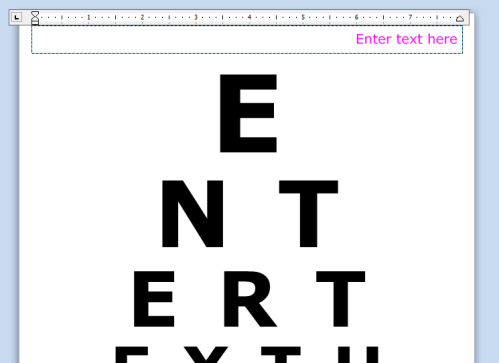 One where you don’t have to fiddle with font sizes, alignment of characters, etc. Just type in your message, and Voila! My idea was to make it easy for the user. 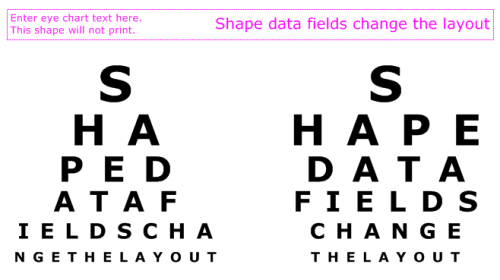 Just type the text in one, single field, then let the shapes figure everything out for you. Notice that spaces are ignored. I found I kept typing spaces and had to concentrate in order to avoid them. So instead of requiring concentration, I just had the software filter them out. It’s best to start at the top row and work your way down. Once you’ve set the start and count for a row, you’ll notice the blank field that suggests the starting value for the next row. The image above shows “[Next Start Index = 7]”. So then, we set the “ATAF” line so that it has Start Character = 7, and Number of Characters = 4. The Row Number field controls the font size. You probably won’t need to change this if you use the pre-built templates. You’ll notice that there is a “Justified” field. 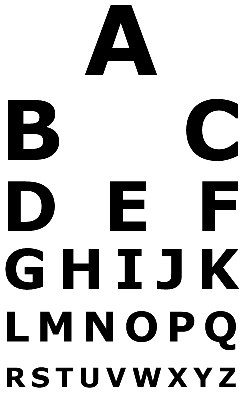 This controls whether the text is aligned in a rectangle or a pyramid. You’ll also notice that the height of each line shape is the same. The font size is actually controlled by the Row Number setting mentioned above. 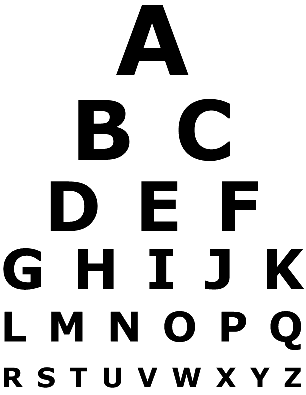 The height of the shape specifies the maximum size, so you want these to all be the same for a given chart. This also allows you to select the whole chart and resize it larger or smaller without getting any surprising distortions. 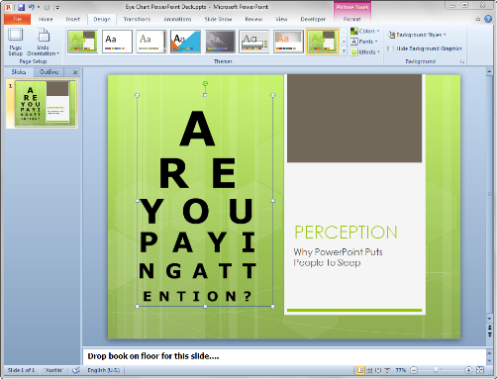 Once you’ve created a hilarious eye chart, just select the shapes, copy them, then paste them into PowerPoint. Quite clever and creative! Fun. How do I stop a connector changing color when dragged from a homemade stencil to a homemade template in Visio? Just wondered if you had a file that worked with Apple iMacs? 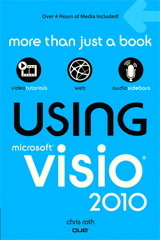 There’s not a version of Visio for Macs, unfortunately.